Accurate monitoring of genome transcription activities is of crucial interest for deciphering gene expression and for a better understanding of RNA biology. Over the past years, various experimental methods for RNA Pol II mapping density across the whole genome have been designed. Here, I’d like to offer a brief introduction to the human Native Elongating Transcript-Sequencing (NET-Seq) method. Epicentre® (an Illumina company) founded in 1987, has been bringing innovative enzymes and kits to the molecular biology, RNA biology, and sequencing communities for decades. In 2011, Epicentre® was acquired by Illumina®, Inc. largely for access to the Nextera™ technology, a great technological advance for DNASeq library prep, quickly rebranded as an Illumina® product. But what about other well-known Epicentre® brands? As detailed in a previous post, rRNA depletion with kits such as Ribo-zero greatly increases the number of usable reads in RNASeq studies, but this one-size-fits-all approach is not appropriate for some researchers. In eurkaryotic studies, researchers often find that poly(A) enrichment using the BioMag® SelectaPure mRNA System making use of BioMag® Oligo (dT)20 Particles is a cost-effective means to separate mRNA from rRNA and tRNA. Prokaryotic mRNAs are not polyadenylated however, so poly(A) enrichment is not a possibility for researchers working with microorganisms. Although there exist rRNA depletion kits for bacteria, the organism-to-organism variability in rRNA sequences may lead to suboptimal depletion in some species and even the unintended depletion of specific mRNAs. An article published in PLoS ONE (DOI: 10.1371/journal.pone.0074286) has described a computer program specifically for the purpose of designing rRNA depletion probes for various organisms. Using the example of the 16S and 23S rRNAs of Mycobacterium smegmatis, the authors report improved mRNA integrity and abundance using this approach compared to using MICROBExpress™. The organism-specific probe selection software is available for download here. Once designed, researchers can purchase Biotin-TEG DNA oligonucleotides and BioMag® Nuclease-Free Streptavidin Particles for efficient depletion of rRNA from their organism of choice. 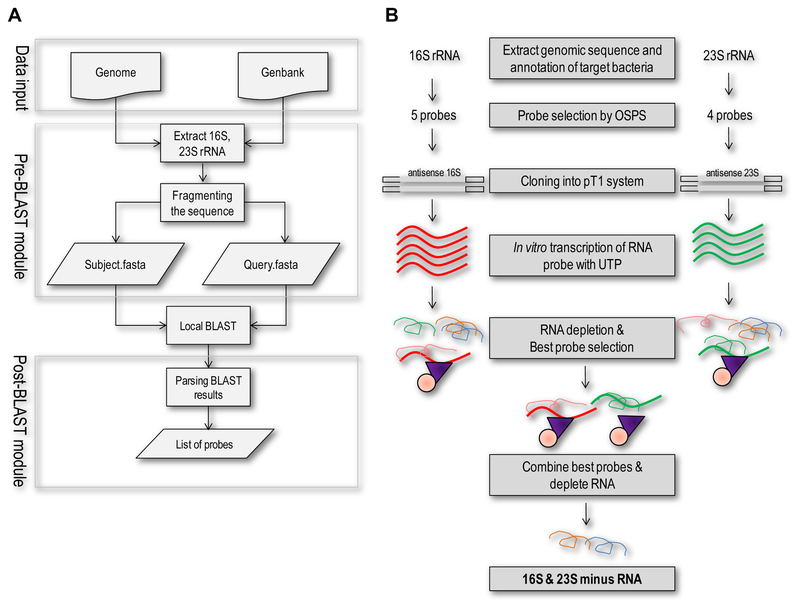 Organism-Specific Probe Selection and rRNA depletion.